Five years ago this month, I became an independent! Yep – back in September of 2004, I followed the advice of a book title I heard of (“Feel the Fear and Do It Anyway”) and resigned my VP/GM Brand and Strategy post at Sony Electronics, Inc. to hang out a shingle as an independent brand consulting partner. I thought I’d take this occasion to recount some of the milestones on the journey I’ve been on since that crazy moment. For those of you who don’t know me well, I hope this post will explain why I believe so strongly in “brand-as-business” – and for those of you who have been my support and guidance, partners and clients over the last 5 years, I hope you will be able to see how you’ve helped get me to where I am today. September, 2004 – I started out with a business card, a hope and a prayer. I wanted to share with the world all that I had learned about brand development and be able to have more impact and help more companies than I would if I had stayed at Sony or any other corporate job. October, 2004 – I got my first gig. I served as an advisor to an advertising agency that was pitching a piece of new business and that wanted to tap my experience in the category and my insider’s knowledge of the client. I was grateful to start off with such an interesting, challenging, and (most importantly) paying (!) project – but even then, I realized that I didn’t want to limit the scope of my work to marketing communications. I was far more interested in the integration of the client’s brand with its business strategy and operations. September, 2005 – I celebrated my 1 year anniversary, having been blessed to have worked on great brands like Frito-Lay, Jack in the Box, and Hitachi in my first year. I learned so much from those first experiences – including that companies of all kinds and sizes struggle with how to close the gap between their brand vision and the reality of their day-to-day business. I drew upon my client-side experience base to try to help my clients navigate through budgets, politics, and processes to build their brands. January, 2006 – I incorporated my business and officially became Denise Lee Yohn, Inc. More than an accounting change, this move signaled my intent to not just be a “freelancer” or a consultant as in I-say-I’m-a-consultant-but-I’m-really-just-in-between-jobs – but rather, I wanted to have direct, vital, and fully accountable relationships with clients. September, 2006 – My second year included projects for Jamba Juice, Kipling, and Road Runner Sports, among others. I drew from and added to my toolkit of methods, processes, and tools that helped companies translate brand strategy into brand execution. August, 2007 – I took a class based on the Strengthsfinder assessment and realized what my strengths are and what gives me energy and gets me excited. Based on this, I decided to pursue more speaking opportunities as a way to share my passion for operationalizing brands. November, 2007 – I attended HOW’s Mind Your Own Business conference and was forever changed! (I’m not exaggerating.) The conference is targeted to creative service professionals, but it is a great learning experience for anyone running a professional services business. Thanks to the provocative conference sessions and the follow-up research I did, I became convinced of the importance of specialization – that is, of focusing on one area of services and/or one market/category. I realized I needed to narrow my scope to “brand-as-business” – the management approach that involves the deliberate and systematic management of the business around the brand. Not only would this differentiate me from all the other brand consultants out there by leveraging my unique experience of having spent so many years on the client-side of business, but also it would enable me to influence and guide companies in the way they needed to grow the most. Furthermore, I decided to more aggressively target companies in the health, fitness, and wellness categories, since I know these categories well (I’m a fitness enthusiast and a former aerobics instructor) and since I had already worked with quite a few of these companies. The learnings I took away from conference truly helped change the game for me. January, 2008 – I launched “brand-as-business briefs™TM,” periodic emailed briefings about how companies can operationalize their brands. I wanted a way to share with and get feedback from others on my thinking about “brand-as-business.” I wanted to know if other people agreed that while breakthrough brand strategies and messaging are important, companies needed to make their brands the central organizing and operating idea of their businesses. People did indeed agree and encouraged me to continue working on and sharing about this. August, 2008 – “brand-as-business bites™,” my blog, launched. I had gotten such positive feedback on my newsletter that I felt there might be a desire for more ongoing communication with my network. Plus, it seemed a blog would provide the venue through which I could share insights with the broader brand and business community. For awhile I have to admit I felt like I was writing into the wind – maybe connecting with a handful of readers. But the process of writing the blog as well as following other bloggers helped to sharpen my thinking and writing, so I kept at it. And, now, I suppose if you’re reading this, then that means I’ve reached a few more folks and hopefully I’m advancing the conversation about brands and how we build them. April, 2009 – I took the Twitter plunge. And lo and behold, it’s been a godsend! I have been exposed to far more people, resources, and ideas through Twitter than anything else I’ve done. I feel much more engaged with current business issues and the latest thinking on brands, and I’ve enjoyed meeting and learning from folks from places as far away as New Zealand and Brazil. I also am learning from how businesses of all kinds are using Twitter to connect with customers and achieve their objectives. All of this, I believe, has helped me be a better resource to my clients as I help them operationalize their brands to grow their businesses. September, 2009 – Today! It’s been 5 years – woo hoo! Thank you so much to everyone who has helped me along on this journey. I’ve purposefully not mentioned specific names of resources, partners, and other folks who have supported me through this journey only because I fear I would offend people by forgetting or excluding them. But please know that I am fully aware of the many people to whom I owe the success of my business. I am extremely grateful for you – I hope you know that. Now as I turn to the years ahead of me, I’m excited and (cautiously) optimistic about what the future holds for Denise Lee Yohn, Inc. and “brand-as-business.” I’ve made some plans and set some goals – one of which I’m delighted to announce today: I’ve started a podcast, the “brand-as-business bites™ podcast.” The podcast features a mix of current blogposts and revisits of past blogposts, along with occasional bonus content and (hopefully in the future) interviews with brand and business thought-leaders. It’s available on iTunes and I would love for you to subscribe and give me feedback. p.s. 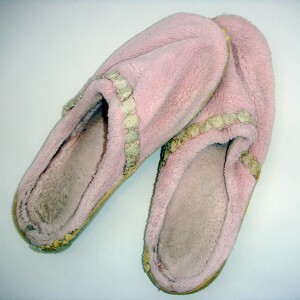 the picture above is of the pink slippers my Sony colleagues gave to me when I left — as you can see, they’ve been worn a lot and so 5 years later, I’m finally going to retire them!